Encourage a young children's love of movement with this simple craft. Here we make ours frozen with blue and white ribbon. The end result is great for frozen make believe and sensory play a like. 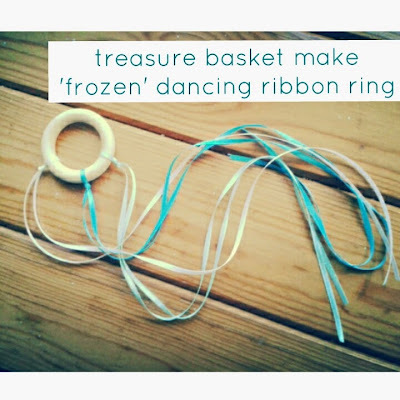 If you have a child who loves the frozen movie, they will love this fun homemade frozen inspired gift. It make a lovely frozen party favour too. Plus it's simple enough that you could set it up as part of a frozen craft activity morning. I've been taking some down time from my blog to try and focus on what goals we have as a family. I'm not sure currently how this blog fits into our future. I've enjoyed the creative output, but running a blog is a full time job. I have mixed feelings on blog link ups. As a fledgling Blogger they often provide much needed traffic from your target audience, but I do sometimes wonder how engaged that audience is. The best link ups(I believe) are the ones with a shared subject matter or goal. Where you begin to get involved in other people's stories, and every week you become more engaged and your network of blogging contacts extends. I often link up with #savouringtheseason because I love embracing the changes in nature in our play activities, so I was upset when I heard this semi regular link up was closing down for the summer. Luckily its being replaced by The Get Good Challenge. Which I'm really excited about. 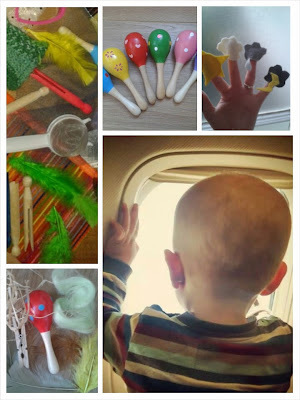 Going abroad for the first time with your baby or toddler can be a daunting prospect especially when that trip involves air travel. Make your summer simpler and pack prepared. Here's our definitive list of must pack items for traveling with small children without clogging up your hand luggage.